Thanh Ha Pottery Village is located on the bank of Thu Bon River, in Thanh Ha Ward, Hoi An City, about 2km west of the Old Quarter. 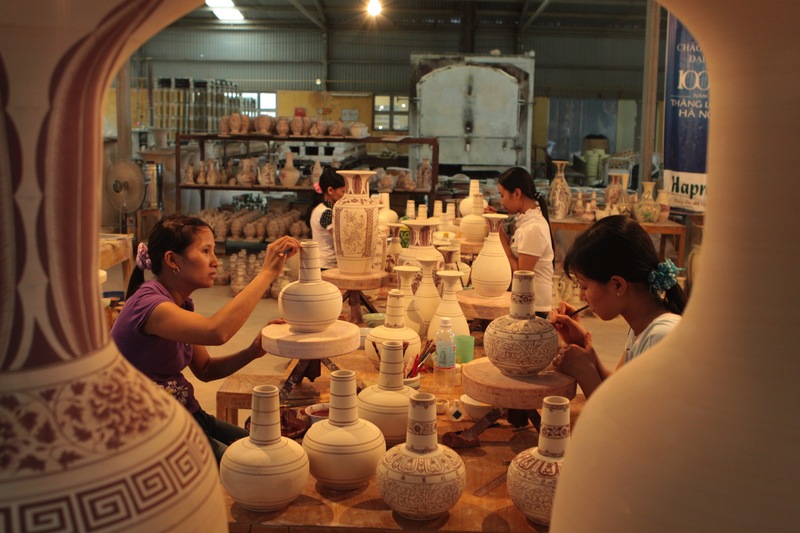 In the 16th – 17th centuries, Thanh Ha was a very prosperous village, famous for pottery. Visitors are easy to recognize from the road, the corner of the roof to the roof are made of earthenware. A peaceful countryside setting with green spaces of straight paths, newly created pottery is being sun-dried. Many beautiful, sophisticated products are made by hand and human brain. The main products in Thanh Ha are the daily life utensils such as bowls, bowls, jars, jars, vases, bowls, animals … with many styles and colors. And especially lighter than other local products of the same type. Pottery Village attracts many domestic and foreign tourists to visit. In addition to seeing the talents in the art of manipulation of artisans, visitors are also guided to manually perform the traditional crafts. Tra Que Vegetable Village is in Cam Ha Commune, located 2 km northeast of Hoi An Here, visitors will see the whole process of growing vegetables in accordance with standards “green-clean-beautiful”. This 500-year-old vegetable village is famous for its many vegetable products grown on fertile soils, with the use of seaweed from Co Co river, which has its own unique flavor. Moreover, this is also the ideal tourist attractions of local and foreign tourists. When you come here, visitors will be the vegetable growers in the village to guide how to grow, care, harvest vegetables to be able to “twist” sowing seeds and vegetables. 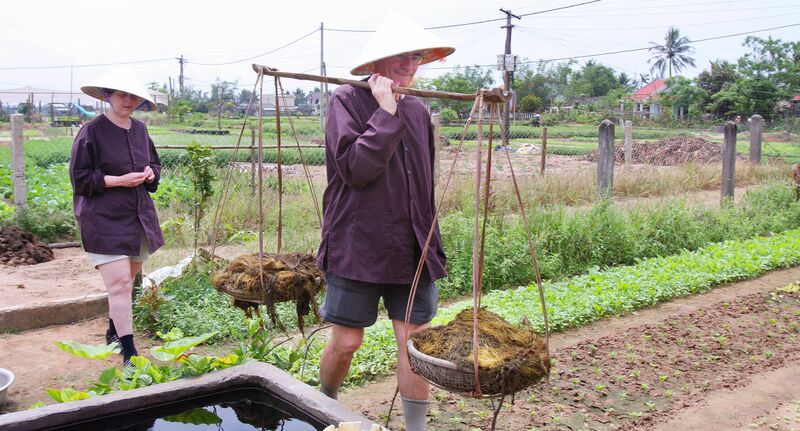 In addition, visitors also enjoy the food processing with green vegetables characteristic of Tra Que such as Quang noodles, Cao Lau… and riding buffalo tour around the village. Located in Cam Kim commune, Kim Bong carpentry village has a history of up to 600 years. Under the reign of the Nguyen dynasty, Kim Bong was famous for its exquisite rustic work with boats and houses. 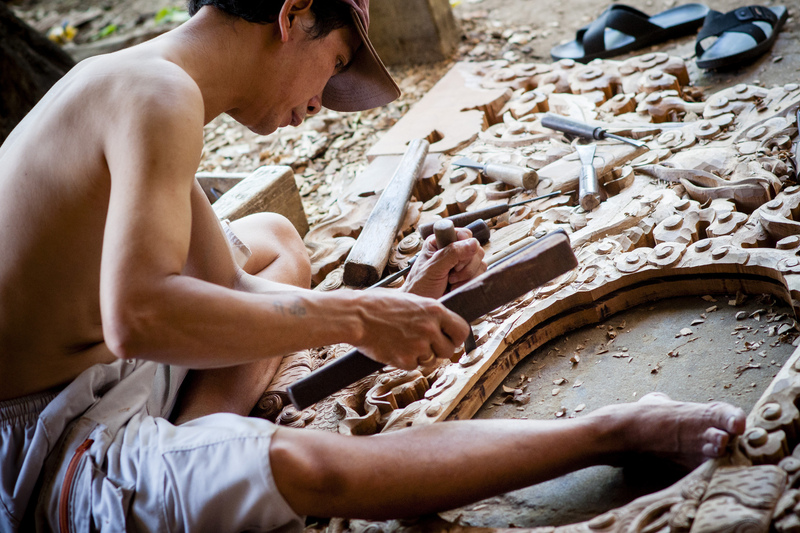 Not only that, the architecture of houses or pagodas in Hoi An ancient town is also designed by the hand of carpenter Kim Bong. To go here visitors follow the Cam Kim iron bridge (inaugurated in early 2016) linking Cam Kim and Cam Pho, two sailing from the old town in about 10 minutes. Guests can choose to take a boat from the old town about 10 minutes or by the iron bridge connecting Cam Kim and Cam Pho. Carpentry products in this village are judged mildly rustic but no less sophisticated. Here, visitors can find the hills, wooden statues, chairs or even small toys are nicely polished to keep the color of nature. The glittering lanterns in Hoi An ancient town is a “specialty” of the ancient city, which is a part of the form, space and soul of Hoi An. 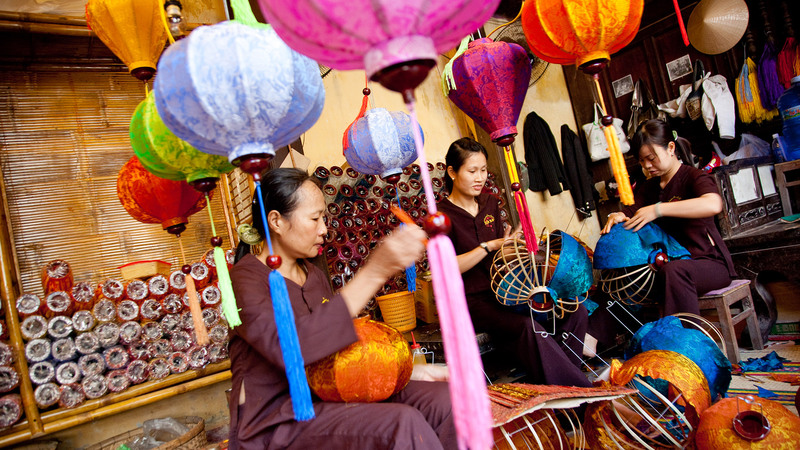 However, the job of making lanterns in Hoi An does not have a guild space, a specific “village”. Lanterns look simple, but to make a lovely lantern, perfect is a process that requires meticulous attention, from the design stage to the selection of materials, colors, paintings and technical installation. Lanterns must be passionate about their creative work and passion for creativity. They can send their minds to the work, blowing their souls into each product, turning each lantern into a true work of art. Highlighted in the central tourist line, Hoi An old town is a rustic, simple and poetic painting with various charms. The Appeal Of Traditional Villages In Hoi An is one of powerful cultural charms that will keep attract visitors to the peaceful destination.